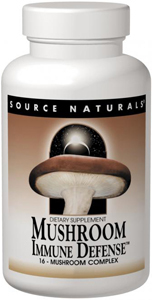 Source Naturals Mushroom Immune Defense is a blend of mushroom mycelia and extracts from 16 of the most well-studied species of health-supportive mushrooms, including Shiitake, Reishi, Maitake, Agaricus, and Cordyceps. Although the exact mechanisms of action in the body are not yet fully understood, researchers show that constituents of these mushrooms support natural killer (NK) cell, T-cell, and macrophage activity, and cytokine roduction. By carefully combining these mushrooms and fortifying them with extracts, Source Naturals Mushroom Immune Defense offers a broad-spectrum, high potency, complete mushroom product. I have confidently recommended this product to individuals with everything from West Nile Disease to Breast Cancer. Any one wishing to boost their immune system will be happy with their results from this product.